Be inspired with new ways of linking faith and your educational mission! How do the Spiritual Traditions of past that built our Catholic Schools adapt to meet the changing needs of modern Australian school communities and maintain a strong Catholic Identity? This fourth volume in The Mission and Education Series from the team at Broken Bay Institute is a must read for all Catholic School leadership teams. 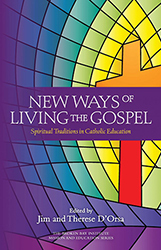 Explore how religious congregations and the lay movements they inspire are evolving their Charism, traditions, Catholic identity, and pedagogy, and finding new ways to live, and espouse, the Gospels. Emeritus Executive Director of Catholic Education, Archdiocese of Brisbane.